Today's products and their constituent components and structures have to meet increasingly stringent requirements during operation. The economic and human costs of failure during service impose a great responsibility on organisations and individuals who develop new materials and those who select and integrate materials in a final engineering processing. A critical feature of successful product development is the judicious selection of the best material or materials, based on an informed awareness of the capabilities and opportunities afforded by all candidate materials, coupled with manufacturing that takes full advantage of those capabilities. IJAMMC publishes a range of high quality peer reviewed research articles including full papers, short communications and technical reports, and occasional special issues that investigate the properties of materials that influence or control any practical design. All types of engineering material are addressed including metals, ceramics and glasses, polymers and elastomers, and composites. The content is broad and relevant to materials researchers, engineers and manufacturers in academia and in industry. 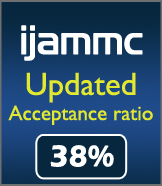 Technical article submissions to IJAMMC are classified into the following categories based on the outcome of the review process. Describe advanced research investigation, conducted in the considerable level with critical analysis and discussion of the results by considering the relevant literature. Are same as full papers but drawing limited conclusion based on small scale investigations. Describe in detail the method approached, progress made and/or results produced from basic research.